Found in the first nest in protected areas. Endangered species, and in the country. Heads of the vultures than 150 across the country. 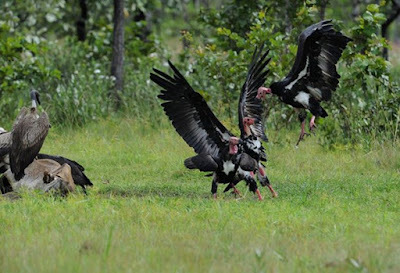 The vultures are only 4 to 6 heads only, from NGO census of (Bird Life). Vultures are being very conservative and feeding the animals everyday. Not sure that are change life it to province other for custom food. Preah Vihear Province and they create family at season 2 of reproduction. And sometimes successful and sometimes unsuccessful. The black vulture and the vulture brown dry reproduction and bore his children up to 2 years. Because the reproduction of the three vulture species face risk because of other birds wish bad on a lot of these vultures. We hope these people also waiting paparazzi vultures regardless together to help preserve endangered bird species as that selfish personal benefit.